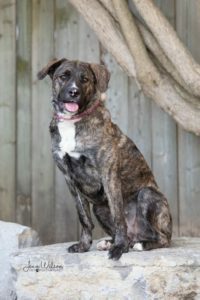 For more information and adoption applications please consult our website at www.pounddog.ca. Let me introduce you to Harlequin! 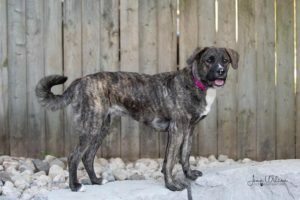 She is an approximately 2 year old Mastiff/German Shepherd/Lab cross. Harlequin is a big girl, she is currently weighing in at about 70 pounds. 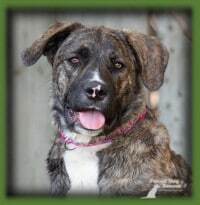 Due to her size we feel she would do best in a home with some room to run around and play. Harlequin has a gorgeous longer haired brindle coat, she has beautiful brown eyes that scream loyalty and her face makes you want to melt. Her coat is super soft and is a bit longer than what you would typically find in a Mastiff. She has beautiful white teeth and if you give this girl the opportunity she will smile at you every chance she gets! Harlequin is such a wonderful dog with an amazing temperament to match. Harlequin was originally a stray at a rural animal control facility and was not claimed by her owner. How her previous owner didn’t come for her is beyond comprehension. We feel this is for the best though because Harlequin deserves to find a family as devoted to her as she is to them. If you give Harlequin the love and attention she craves, then she will be the most loyal member of your family. She needs to belong in a home where she will not be allowed to roam free and get lost, a home where she can be confident in the fact that she is home forever and will never be lost or abandoned again. Harlequin would do well in pretty much any detached home situation, she is very calm and quiet when she is indoors and basically wants to go everywhere you go, including the washroom. Harlequin experienced some separation anxiety when she first came to us, but after some hard work on everyone’s part Harlequin is much more confident that when you leave you will come back for her. 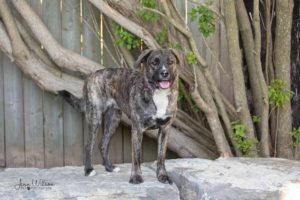 Harlequin currently lives in a home with two other dogs and a cat, from day one she has gotten along with all resident animals, Harlequin enjoys rough play with the other dogs but knows how to be super gentle when it comes to smaller and younger dogs. 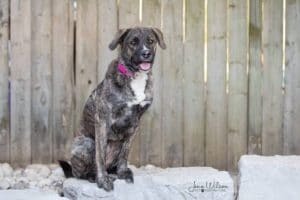 We think Harlequin would be happy either being an only dog (she would love getting all of the attention) or going to a home with another large breed dog for her to play with. Harlequin has been living with two school aged children, she gets along very well with them, however we feel Harlequin would be best suited to go to a home with children who are at least 12 years of age and who have complete understanding on how to play respectively and appropriately with dogs. Harlequin is still young and sometimes forgets how big she is, and true to the Mastiff in her she is quite clumsy! person or family experienced in training large breed, working dogs. Harlequin respects authority and is at her best when she is quite sure where she stands in the family. If interested in Harlequin please ensure that you are quite capable of being authoritative and confident with dogs and have experience training working dogs to a high level of obedience. This is where Harlequin shines!!! Her ability to learn is tremendous and we don’t want this wasted. Harlequin is being taught basic obedience in her foster home and knows “sit”, “down” “off”, “no” “wait” and “come”. Harlequin has done a fantastic job when it comes to meeting new people who come in the house, she has never jumped but she does expect some pets! Harlequin’s new family should commit to continuing her obedience training to bring out the best in this smart dog! Not only would it provide a safe environment for some bonding with your new family member, but it will also show Harlequin that you are the one in charge. continue being the well behaved, lovely dog that we know her to be. Her new family will need to continue to walk her in the manner she is accustomed and trained to while also understanding that on leash dog meets are not a necessity. On the occasions that we come across a squirrel or a bird she just stops to watch where they are going to go. What Harlequin wants most and craves is love and affection. If you let her, this girl will snuggle with you on the couch or take a nap with you in bed. Harlequin is happiest when she is by your side getting love and attention, she will follow you everywhere you go and always wants to tag along. Harlequin wants to know that she will never get left behind, she craves the companionship of a human all the time. Harlequin sometimes has a hard time being crated when it’s either bed time or time for the humans to run some errands and will cry a bit before settling. She has been making wonderful progress though and at night she sings you a short lullaby from her crate before she falls asleep. When it’s time to leave to do the groceries or go to work, Harlequin will happily walk into her crate and wait for you to give her a tasty treat! Once Harlequin knows your home she starts singing to tell you how excited she is to come out of her crate and play! She sleeps in her crate at night, however Harlequin is such a good housemate that we feel as long as you are home she would curl up beside you at night and be happiest being where you are. Harlequin will let you brush her, touch her paws, check her teeth and clip her nails, all she wants is a little bit of love in return! Harlequin has been such a good girl during her stay with us, she is fully housebroken. Harlequin has been an easy dog to foster and an even easier dog to love. We still find it outrageous that someone let her go! We are happy to report that Harlequin loves car rides! As soon as she is in the car she settles down and will sleep the whole ride or else just watch the scenery go by. Harlequin is looking for her forever home to be with someone who can give her all the love and attention she deserves and keep her on her toes with continuing her training. Harlequin wants to be with someone all the time, so someone who will spend time with her outside in nature going for walks and hikes, and also spend time at home with her is a must. It would be ideal if Harlequin was not left for extended periods of time while someone is working. Do you think you can be that perfect forever home for this beautiful girl?